The Rev. 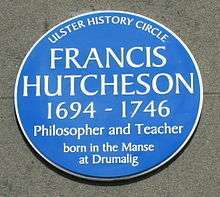 Francis Hutcheson (8 August 1694 – 8 August 1746) was an Ulster-Scots philosopher born in Ulster to a family of Scottish Presbyterians who became known as founding fathers of the Scottish Enlightenment. But though Hutcheson usually describes the moral faculty as acting instinctively and immediately, he does not, like Butler, conflate the moral faculty with the moral standard. The test or criterion of right action is with Hutcheson, as with Shaftesbury, its tendency to promote the general welfare of mankind. He thus anticipates the utilitarianism of Bentham—and not only in principle, but even in the use of the phrase "the greatest happiness for the greatest number" (Inquiry concerning Moral Good and Evil, sect. 3). Hutcheson does not seem to have seen an inconsistency between this external criterion with his fundamental ethical principle. Intuition has no possible connection with an empirical calculation of results, and Hutcheson in adopting such a criterion practically denies his fundamental assumption. Connected with Hutcheson's virtual adoption of the utilitarian standard is a kind of moral algebra, proposed for the purpose of "computing the morality of actions." This calculus occurs in the Inquiry concerning Moral Good and Evil, sect. 3. 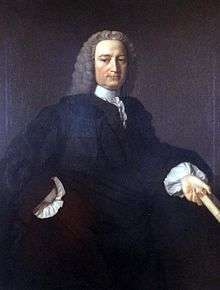 Francis Hutcheson spent time in Dublin, and died while on a visit to that city in 1746. He is buried in the churchyard of Saint Mary’s, which is also the final resting place of his cousin William Bruce. Today Saint Mary’s is a public park located in what is now Wolfe Tone Street. Many United Irishmen would have revered the memory of Francis Hutcheson. Some of the leaders of the Dublin United Irishmen are remembered in the street and place-names of the city. Most Dubliners can direct a visitor to Wolfe Tone Street, Oliver Bond Street, Russell Street, Lord Edward Street and Emmet Road. ‘Never to be forgotten Hutcheson’ lies in what is now an unmarked grave in the Dublin he loved and ‘where his best work was done’. ↑ Scott, William Robert (1900), "Hutcheson's economics and his relation to Adam Smith", in Scott, William Robert, Francis Hutcheson: his life, teaching and position in the history of philosophy, Cambridge: Cambridge University Press, pp. 234–235, ISBN 9780559151927. ↑ Scott, William Robert (January 2011). "The never to be forgotten Hutcheson: excerpts from W.R. Scott". Econ Journal Watch. Atlas Network. 8 (1): 96–109. ↑ Fiering, Norman (1981). Moral Philosophy at Seventeenth-Century Harvard: A Discipline in Transition. University of North Carolina Press. p. 199. ↑ Stevens, Benjamin (1761). A Sermon Preached at Boston Before the Great and General Court or Assembly of the Province of Massachusetts Bay in New England, May 27, 1761. Boston. pp. 63–64. ↑ Robbins, Caroline (April 1954). ""When it is that colonies may turn independent:" an analysis of the environment and politics of Francis Hutcheson (1694-1746)". William and Mary Quarterly. 3rd Series. Omohundro Institute of Early American History and Culture via JSTOR. 11 (2): 215–216. doi:10.2307/1922040. JSTOR 1922040. ↑ Sloan, Douglas (1971). The Scottish Enlightenment and the American College Ideal. New York. p. 88. ↑ Norton, David Fate (1976). "Francis Hutcheson in America". Studies on Voltaire and the Eighteenth Century. 154: 1548, 1566, 1567. ↑ Witherspoon, John (1982). Jack Scott, ed. An Annotated Edition of Lectures on Moral Philosophy. Newark: University of Delaware Press. pp. 27, 29, 35–37. ↑ Adams, John (1961). L.H. Butterfield, ed. Diary and Autobiography of John Adams. 1. Cambridge, Mass. p. 2. ↑ Wills, Garry (1978). Inventing America: Jefferson’s Declaration of Independence. New York. ↑ Hamowy, Ronald (October 1979). "Jefferson and the Scottish Enlightenment: a critique of Garry Wills's inventing America: Jefferson's Declaration of Independence". William and Mary Quarterly. 3rd Series. Omohundro Institute of Early American History and Culture via JSTOR. 36 (4): 503–523. doi:10.2307/1925181. JSTOR 1925181. ↑ Alexander Brodie, ed. (2003). The Cambridge Companion to the Scottish Enlightenment. Cambridge. p. 320.